Almost every major arms and armour collection boasts at least one schiavona. They range from highly decorative to bare bone plain. The baskets on the schiavona are made in a great variety of forms, are all excellent protection for the sword hand and wrist. Almost all schiavona have a steel basket and a brass "cat's head" pommel. It was typically fitted with a double edged blade, that are made for swordplay that utilizes the cut as the main combat tactic. Some of the schiavona blades were so thin it is hard to believe, and back up the fact that this is a deadly cutting sword. The swordsman, armed with a schiavona and buckler, would be hard to stand against, and woe to an opponent armed with a rapier. 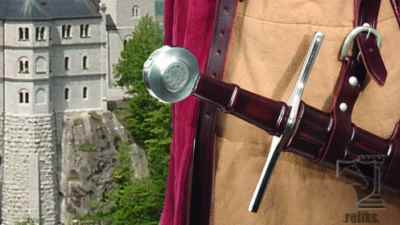 A beautiful and important sword that saw use throughout Europe. Made from well tempered, high carbon steel forged by Windlass Steelcrafts�. 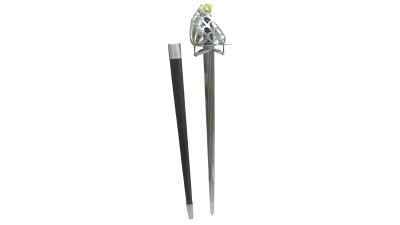 Scabbard is included with the schiavona functional sword. Circa 1600-1700.